Company Name: Shinoda Plasma Co., Ltd. 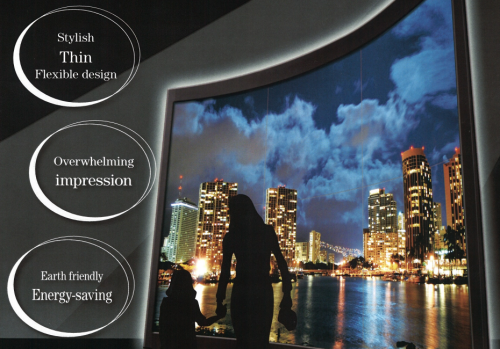 Screens have become increasingly larger and thinner in recent years and power consumption has increased, accordingly. In addition, the large size of their production facilities and the amount of power consumed by manufacturing them have also become problematic. Founded in 2005 by Tsutae Shinoda, who spun off the company from Fujitsu Ltd. Focusing the target on 100+ inch life-size large-area displays, the company is seeking market penetration of light-weight, ultra-thin, energy conserving and flexible products in such areas as billboards, transit advertisements, and large control-room monitors. Shinoda Plasma Co., Ltd. has developed a new technology, called PTA (Plasma Tubes Array) to overcome these issues. The company has commercialized a super-large screen with a film-type display, bigger than the 100 model, with its display part being only 1mm thin and able to attach to a curved surface, for the first time. Compared with a conventional thin screen, it is one fifth the thinness, one tenth the weight, and one third the power consumption. It doesn’t require investment in a large production facility, either. As a super-large screen can be installed just by assembling its 1-meter-square sub-modules on which the plasma tubes are aligned, it can be carried easily and can be set up anywhere. In November 2009, “SHiPLA,” a 145-inch display, was first delivered to Akashi Municipal Planetarium in Akashi City, Hyogo Prefecture. 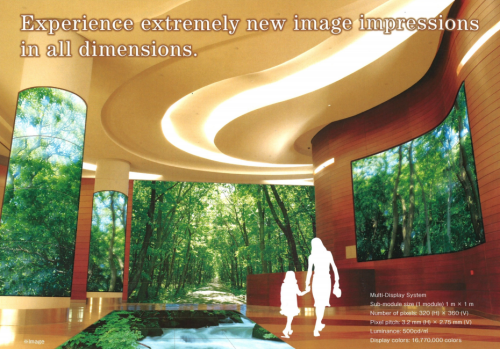 It is attracting more and more attention as the next-generation digital signage.